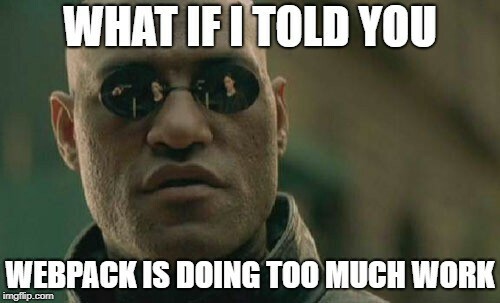 What if I told you your Webpack is doing too much work all this time? Webpack 4 brought a lot of goodies for developers but to use it at scale, the Outlook team at Microsoft had to take a hard look at the incremental build numbers to find out. Here’s how we made our incremental builds go from 35s to a consistent 5s. I guess it goes without saying that you MUST measure in order for you to know you have made progress! As you can see, we’re clocking in at around 40s here per incremental build. This is not exactly true because we lose about 5s of it due to profiling. In measuring with our internal telemetry, we noticed that our devs are hitting around 30–35s on avg (and sometimes over a minute at the 75th percentile) incremental builds. So, as soon as you look at those colors, you would recognize three separate phases of the incremental build process. With this in mind, let’s tackle the first enemy. This is the big one — it brought our incremental speeds from 30s to around 15s. Update: the webpack-dev-server maintainers had accepted my patch! So, go ahead and use webpack-dev-server@3.1.2. Personally, I have observed a slight 0.5s regression between 2.x release and the 3.x release, so we’re keeping the 2.x for now until we can move to using webpack-serve. If I were to ask you to build an incremental compiler based on Typescript, you would likely first reach into the Typescript API for something that it is using for its watch mode. For the longest time, Typescript safe guarded this API from external modules. During this time, ts-loader was born. The author of the loader tracked the progress of another Typescript-centric loader called awesome-typescript-loader and brought back the idea of doing type checking on a separate thread. This transpileOnly flag worked remarkably well (with a rather glaring caveat that const enums are not supported out of the box — here’s a workaround from the ts-jest repo) until the codebase reaches a certain size. In OWA, we have nearly 9000 modules that we shove across this loader. We have found that the first phase of that incremental build is linearly growing as our repo grows. Things looked pretty grim until the Typescript team decided to take on this mammoth work of expose the watch API to external modules. Specifically, after this was merged, ts-loader is super charged with the ability to limit the amount of modules to transpile at a time per iteration! The incremental builds now only rebuilds around 30–40 modules rather than 50% of our modules! I also have a way to CAP the growth of the incremental builds in the first phase. This optimization cuts our 15s to around 8s. Most everyone would be pleased with that 6s figure, but why should we humans not demand MOAR? Yes, MOAR speed!!! So, I advise everyone doing heavy Webpack development to switch BACK to node v8.9.4 for now. Software is eating my family.